Win 5000 Feet of Yarn! 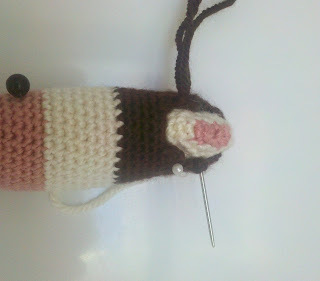 "Someone took a bite out of me"
I have a soft spot for food amigurumi, so I thought for my next pattern, I'll try to make something food-related. I chose neapolitan ice cream popsicle mainly because I like the colour combination, even though the only "colour" I would actually eat is vanilla. Have fun making your own popsicle. Popsicle is approximately 5.5" tall and 2" wide. Exact gauge is not important, but as with all amigurumi, crochet tightly to make sure no stuffing will be seen between stitches. Number in ( ) at the end of each round: total number of stitches you should have by the end of the round. I worked in continuous spirals instead of joined rounds, because personally I don't like that diagonal seam line, but if you prefer to do it that way to make a better colour change, it's totally fine too. Rnd 1 Ch 12. 1 sc in the 2nd ch from hook, and sc in the next 9 ch. Rotate your work so the other side of the chain is facing up. Sc in each loop of ch (11 sc), until you reach the last loop. Do 3 sc in that loop. and now continue doing 1 sc on the straight side again (9 sc). If you're using safety eyes, add them in now. Fasten off. You should have something like this. Stuff the piece. Now we're ready for the fun part and create the "bite" in our popsicle. 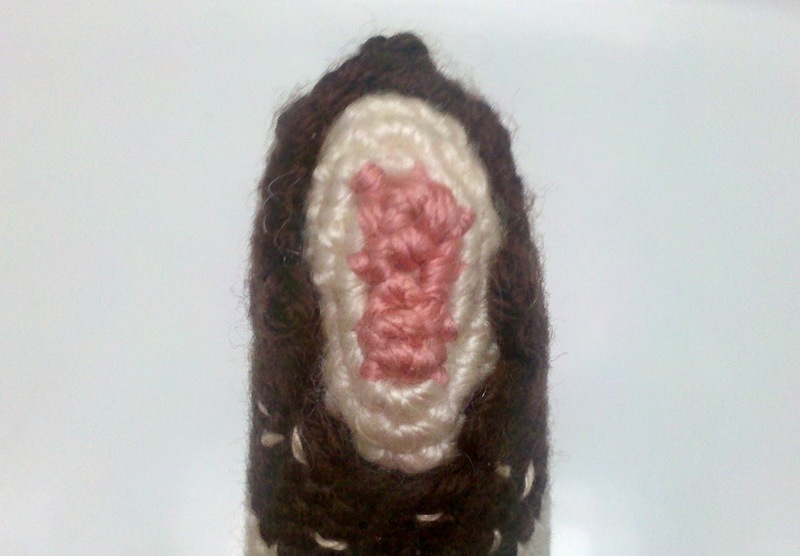 Bascially, the uneven edge of the bite is created by not crocheting all around in the 30 stitches, but turning and leaving stitches undone in every round. The number of stitches you'll have to do for each row will get smaller and smaller as you go up to the top of the popsicle. In the crochet world I think they call that a decrease for each row to create a staircase effect. On the opposite side of the bite (in mine, the left side of the popsicle), we will gradually work in invisible decreases to shape the popsicle. As you're crocheting, you can adjust accordingly to create the size and the look of the bite you want. I've put down a rough estimate of what I did, but it's more fun to shape it as you go along. Rnd 1 Using brown yarn.If you flatten your popsicle, we're going to start from the 3rd stitch from the right edge. 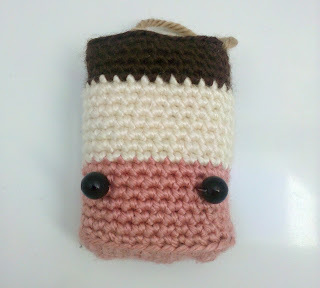 Insert your hook into that stitch, and pull up a loop with the new brown yarn. Ch 1. 1 sc in the next st, sc into the next 23 stitch, and sl st into the next st.
Rnd 2 Ch 1. Turn (so you're now inserting your hook from the inside of the popsicle to outside, going left to right again (if you're right-handed). Sc in the next st, sc into the next 22 sc, sl st into next st.
Rnd 3 Ch 1. Turn. Sc in the next st, sc into the next 8 st, inv dec, inv dec, sc in next 8 st, sl st into the next st.
Rnd 4 Ch 1. Turn. Sc in all st around. Rnd 5 Ch 3. Turn. Sl st into the base st of the chain (This will create a "bump" that stick out in your bite). Sc in the next 7 st, inv dec, inv dec, sc in the next 7 st, sl st into the last st.
Rnd 6 Ch 3. Turn. Sl st into the base st of the chain. Sc in all st around, sl st into the last st.
Rnd 7 Ch 1. Turn. Sc in the next 5 st, inv dec, inv dec, sc in the 4 st, sl st into the last st.
Rnd 8 Ch 1. Turn. Sc in all st around. Rnd 9 Ch 1. Turn. Sc in next 4 st, inv dec, then sc in the remaining st.
Rnd 10 Ch 1. Turn. Sc in all st around. Fasten off. Leaving a long tail for sewing. Whip stitch the top of the front and back chocolate pieces together using the tail. If you prefer, you can embroider the sprinkles in now or wait till later. Whether you need another round or not depends on how big you've created your bite, so put this inside your popsicle to see if it fits well or not. Fasten off. Add more stuffing to the main body of the popsicle, then sew this piece to it. 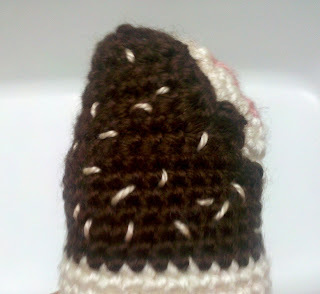 I just pinned the bit to the main piece, then used the left-over brown yarn tail to secure it. Rnd 1 Make a magic ring with 6 stitches in it. Fasten off, and leave a long tail for sewing. I added cardboard to the inside to make it stiffer before I sewed to body. Randomly add in your sprinkles to the chocolate part of your popsicle. I did this back and forth on the front and the back of the piece. Then add the mouth in using the black embroidery thread. And of course, you can have your popsicle smiling instead. Pattern is for personal use only. Please do not sell items made from it (charity okay). Please do not reproduce the pattern anywhere, but link to this post ( http://ow.ly/cPHJD ). Thanks! 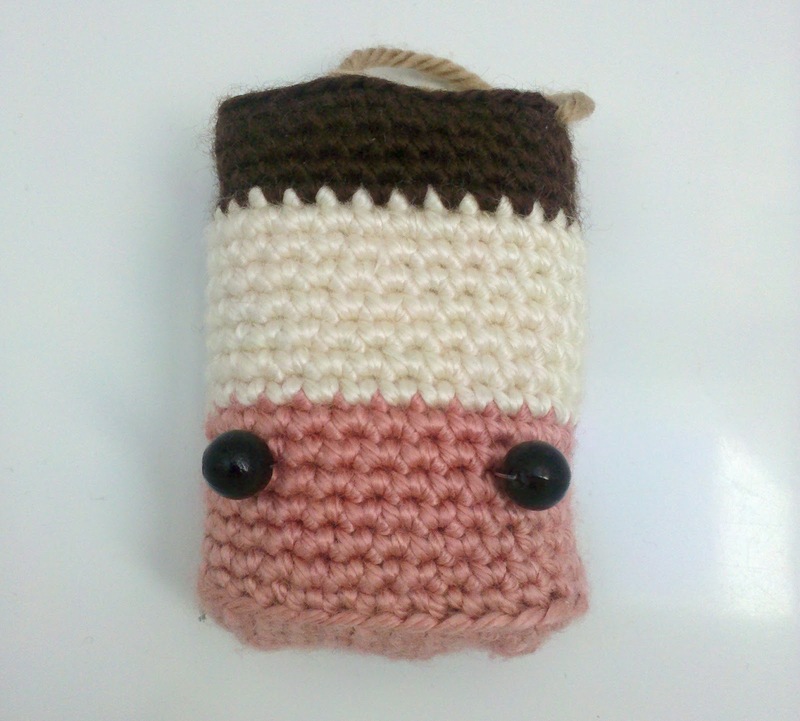 Thanks for this funny pattern ^-^ I will soon release it ! This is super-adorable, and a great summertime craft. I'm adding it to my list of things to crochet.... eventually. This is my popsicle: http://descabdello.blogspot.com.es/2015/08/vols-fer-un-gelat-de-ganxet.html Thank you for the pattern. It's so cute. This is so cute! Thank you for sharing your pattern, what a big heart you have! Thanks for taking the time to write a comment. My name is Virginia and I thought I'd keep a record of all the neat things I find and learn for other amigurumi and crochet beginners like me. Enjoy your stay here!